Evidence, for design, based on the perception of comfort, is biomechanically worthless. Conversely a chair that has correct biomechanics is always comfortable. Correct Biomechanics = Maximum Comfort. Discomfort is probably a different modality and is significant. This can only be effected from medico-scientific design. Observation confirms the working assumption that an optimised configuration would inevitably ensure maximum comfort. The Public judges a chair by it’s immediate comfort and intelligently ignores the ergonomic benefits described by the salesman. I am told that this is not so in China where the health benefits are paramount. I had rather forgotten about ‘comfort’ as it had been shot down by the scientific community as far back as 2003. When I asked several top chair designers at a trade show (2015) all gave ‘comfort’ as their main objective. They failed to understand that comfort, free from adverse effects, can only be achieved by an understanding of spinal biomechanics and necessary requirements incorporated into the design. Such a design is, by it’s nature, always comfortable. This misunderstanding seems to have misled the industry up a wrong path which has resulted in the absence of any chair in the market that is not likely to exacerbate LBP on prolonged use. Much of the ‘ergonomic’ research on seating seems, to be based on the ‘comfort’ assumption. For example, “Trial 1. A test chair was created with 35 spring-loaded diodes to measure support in the lower back region by remote control. 200 test persons have adjusted the support in he lower back region again and again until they felt comfortable. The sensors provided the scientists with data which they evaluated using pressure mapping technology. The procedure was repeated several times and the results were clearly confirmed”. This, based on biomechanically worthless evidence gives no help in assessing what is correct for the underlying spinal constituents. Even today (2016) a Hermann Miller article writes as it’s 1st principle for design “1. A chair should be perceived as comfortable before, during, and after sitting upon it. Comfort is as much a matter of the mind as of the body.”. Perceived by the mind is perhaps OK, but is no substitute for the body (spine) which requires correct biomechanics. Gorman, who developed the concept of ‘Iliac’ support and has been involved in car seat design, wrote to me “Comfort tells you nothing” and continues “The car industry has to concentrate on comfort because we spend so much time sitting still in cars. They measure comfort as a lack of localised pressure and have lots of methods to measure it. This used to be large mats of little bubbles which could be individually measured for pressure. Now there are probably much better with mats of pressure sensitive material like large touch screens. This was always a problem for me when I got my prototypes evaluated by Fiat, Magna, Chrysler, etc. My pelvic support does require force round the iliac crest so even if the seat was subjectively comfortable it would fall down on the pressure measurements”. “On your comment about comfort, this link to my web pages discusses the origin or this, and the reason that no one really asks about comfort anymore, discomfort is pretty standard. Namely the Corlett and Bishop article (1976) completely turned our head on the issue. They pointed out that not only is comfort nearly impossible to measure in a predictable way, but it is not the opposite of discomfort – and may even be an entirely different dimension” . 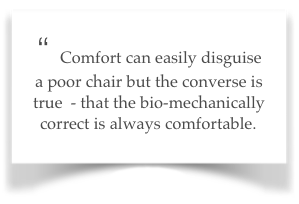 Anecdotally, I have seen many chairs pronounced as marvelously comfortable and ergonomically ‘correct’, which have biomechanics faults. I was asked to see a control room which was responsible for the UK nationwide supply of a major utility. The control room had been optimised for it’s indoor environment so that the air quality, lighting, sound abatement, humidity and colour scheme were marvelous. Everyone was happier, and absenteeism and minor morbidity had decreased. The exception was that backache had remained constant. I found that the workforce, had been allowed to choose the chair. Of course, the most wonderful, expensive, all singing, all dancing chair had been chosen. The staff gave it full marks in the questionnaire. The only trouble was that it gave inadequate support to the lumbar spine. A chair designed along 2T (3M) principles was judged “This chair is much too comfortable. My work force will go to sleep”. This was the comment of a CEO who was lying on the prototype P1. Seat and backrest were of roughly, but correctly, moulded plywood with no padding whatsoever. This was a common reaction of management. A 2M (2T, BiModal) or 3M design (TriModal) is based entirely on bio-mechanical research and, pro tem, can be used for comparison to assess the effectiveness of any chair design. The comfort of the 2T concept was constantly remarked regardless of the nature of back & seat components. This, to some extent,confirmed the working assumption that an optimised configuration would inevitably ensure maximum comfort. The scientific evidence shows optimised configuration can only occur in a reclined mode. The ergonomic research approaching from the opposite direction and largely financed by industry, was suspect. This is changing. A recent overview editorial by P. Vink in Applied Ergonomics has evaluated a number of comfort/discomfort models and has proposed a new one. This draws heavily from the work of Moes, N.C.C.M., 2005 and De Looze,2003. This entry was posted in Uncategorized on October 9, 2013 by Dr. Henry Sanford. The issue with ‘comfort’ is that it is the term, that has been used for decades, by design college tutors when educating the next generation of furniture and other design students. So each is encouraged to develop his or her own version of the ‘comfort curve’ , although not determined by ergonomic research, and to then apply it to the central profile of their next seating design. The ‘comfort curves’ will likely be based on each individual’s own ergonomic observations and measurements, which they will be encouraged to carry out during their first year projects, as well as any accumulated data they have access to, either within their own group’s activities, or from that of past student years, plus what is also available through research in their library and now, online. Of course, that will depend on each colleges’ curriculum and schedule. Very often, the intention of those early projects, is the introduction of ergonomics to the students, through anthropometric measurement and application. So the curves they generate, might well be useful and apt, if they are at all competent. But that still leaves the issues of spinal damage through vertical compression over time, plus the misinformed dependency on the notion of lumbar support, as opposed to iliac support. Introducing medical-based information to designers and their education, at an early stage in their careers, would be a good way to change the status quo. The question is: how do you get that over to them in a lucid and easily digested manner? It needs to be described and presented in an easily accessible manner and not necessarily couched purely in medico-scientific terminology. I very much doubt that existing large manufacturers with a heavy vested interest in the status quo will provide a leap forward any time soon, or pressurise their own design teams to rethink their principles, while they can continue to make good money from what they have all been doing for centuries. But once someone starts to make inroads into their profits, then they will have to take notice of any new approach. Something similar to the work you did with Cambridge needs to be encouraged at furniture design colleges around the globe to drive things forward in a more structured manner and to inform the next generation as to why it all makes sense. So I guess you need an instruction package to place in lecturers’ hands across the globe! But, as we’ve seen this year, there is already a move towards your end-point in a few places now. It just needs some encouragement to make it mainstream. What you say is interesting. While working at Cambridge, at my suggestion, a design team from another university was invited down. It was obvious from the start, that their mindset was that of 1998 familiarity bias and so went nowhere. My point is that the ergonomic evidence alreadyy exists for correct curves which are fully compliant to spinal requirements and automatically ensure optimal comfort. Efforts by students to achieve the equivalent, almost certainly based on popular misconceptions, will almost certainly be useless and probably adverse. My apologies that my terminology is obscure. It is read by scientists who tend to be irritated by popular expressions as well as a more general readership. De Looze, M.P., Kuijt-Evers, L.F.M., Van Dieën, J.H., 2003. Sitting comfort and discomfort and the relationships with objective measures. Ergonomics 46, 985–997. Moes, N.C.C.M., 2005. Analysis of sitting discomfort, a review. In: Bust, P.D.,McCabe, P.T., Contemporary Ergonomics 2005. Taylor & Francis, London, pp. 200–204. Kee, D., Lee, I.,Relationships between subjective and objective measures in assessing postural stresses.Applied Ergonomics, Vink P. Applied Ergonomics. journal homepage: www.elsevier.com/locate/apergo & Vink P. Ergonomics 43 & 46, 985–997.